You are here: Home / Weekly Columns / Opinion / Google Stadia: At the Mercy of the Internet. (ThyBlackMan.com) The future of Google Stadia is at the mercy of the internet. Some people call it a console killer, while many others see the future of gaming in Stadia, but the fact is, Stadia can’t succeed in any of these areas, at least not within the next five years. At GDC 2019, Google announced a brand new game streaming service called Stadia. The company’s aim is to bring all video games to the Chrome browser so that people won’t have to buy consoles or PCs to play games. The service will render all the information about the game in Google’s data centers spread across the world. 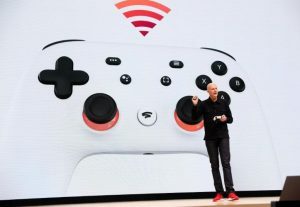 The compressed version of games will then be available on Chrome so that users can connect their Stadia controller to provide input. This data will be sent back to the data centers over the internet. During the whole process, the most important thing Stadia needs is extremely fast internet speed. There’s no doubt about Google’s capabilities. The company already controls a strong network of data centers. Delivering streaming services at a large scale won’t be a problem for a company like Google, but the real challenge lies in execution. The streaming service will require a superfast internet connection which is usually not available everywhere. You may have heard some people saying that the days of the console gaming have been numbered. While it’s true that even the big players like Microsoft and Sony are focusing more on streaming services, but the environment Google is trying to create with Stadia is still very uncertain. The global average internet (download) speed on fixed broadband is just 55.58 Mbps and on mobile, it is 25.27 Mbps, as of February 2019. If we look at the data from the United States, the average speed on broadband is 115.14 Mbps and on mobile, it is 33.45 Mbps. These numbers don’t necessarily mean that everyone is enjoying fast enough internet speeds. The recommended speed for Stadia, as suggested by Google, is 30 Mbps for 4K. For low-resolution streaming, this will be a little less. Despite a powerful infrastructure backing Stadia, even this much speed requirement is a turn off for many because most of the people around the world don’t get that much internet speed. Even if players manage to get the minimum required speed, data capping would be the next challenge. High-speed internet that too without a data cap is not going to be cheap. Google has not revealed exactly how much money you’ll have to spend to play a game on Stadia. The basic internet costs will always be there no matter what type of games you play. Needless to say that consoles and PC still offer players the option to choose between online and offline games. There are many games which you can play online and offline. For Stadia, Google will likely go for a subscription model. It’ still unclear whether the player will have to buy games separately at AAA price or the subscription fee will be inclusive of the game’s retail price. Google says Stadia will bring games to mobile phones as well. The company also said that users can resume their gameplay exactly from where they left off. The idea sounds great and it should work well on PCs, but for mobile phone users, this is not going to be the case as commuters may not be able to enjoy these benefits. Where does Google Stadia stand? Google’s position in the cloud gaming market looks strong. While most of the games on Sony’s PS Now stream at 720p, Google confirmed that Stadia supports the 4K resolution at 60 frames per second with the possibility of bringing 8K at 120 frames per second if and when the need arises. Google Stadia servers will be powered by a custom chip. Each of these servers runs on an x86 processor at the power of 2.7GHz coupled with 16GB of RAM. There’s a custom AMD graphics processing unit with a massive power of 10.7 teraflops and it has 56 compute units. Google Stadia beats both PS4 Pro and Xbox One X in the game of power and performance. Readers should also note that a next-generation Xbox and a new PlayStation are also coming soon and these new consoles will be faster than the existing consoles. As always, it’s the content that matters. Google Stadia doesn’t have many games at this point. Google Stadia offers the opportunity to create more ambitious games. Possibilities for online multiplayer games are tremendous, but the content is missing at present. For game developers, cloud removes the restrictions in terms of the file size of games. Streaming will also improve simulation and in-game physics quality. Not providing client-side codes on a user’s machine will also reduce the risk of cheating. So overall, Google Stadia has the potential, but there are many challenges. Cloud gaming started before Google Stadia, but game developers still don’t have any data to rely upon. This leads to confusion as nobody at this point knows how exactly the revenue model will work for developers. Currently, game developers use game engines that need a lot of support from the hardware whether it’s a PC or console. Without answers from cloud gaming giants like Google, nothing matters at this point. There are many unanswered questions for game developers and players. Google Stadia will let you play any game on your Chrome browser if you’ve got high-speed internet. You can also play games even on low-end devices. But it all looks good as long as you are not the one with an unreliable internet connection.